The On Target is an ambitious project of Pafos 2017 about war and violence. The original idea is based on the work “Human Targets” by the Cypriot visual artist Rinos Stefani. The curator of the project, prominent German art historian Inge Baecker, with the assistance of visual artist Susan Vargas invited artists Tammam Azzam, Molitor & Kuzmin, Ulrike Rosenbach and Rinos Stefani to participate in the exhibition which will last from 9 July – 30 September 2017. The exhibition also includes works by Wolf Vostell, one of the most influential artists of contemporary art, a pioneer of Happening and Fluxus. Opening of Exhibition: 9 July 2017 at 20:00. The On Target project also organizes a presentation- discussion on 5 July 2017 about “Art and Violence”. Cyprus is surrounded by countries in conflict and has itself gone through the experience of war and refugees. Military targets, check points and the Buffer Zone constantly remind us of this violence. Similar situations are being experienced in many places in the world. Eco Art is one of the most ambitious projects of Pafos 2017 with cultural and ecological vision for Cyprus and Europe. Under the subtitle: Paths on Common Ground – Works in situ, the curator of the project Thouli Misirloglou, invited visual artists Rinos Stefani, Hermann Pitz, Horst Weierstall, Costis Velonis, Stavros Panayiotakis, Mimmo Rubino, Marinos Tsaggarakis, and performers Marios Hadjiprokopiou, Antonis Antoniou and Anna Tzakou to create their works in Akamas natural areas and communities. The project will highlight the relationship between art and nature, open a dialogue on crucial issues and create an important legacy in contemporary art in Cyprus. Susan Vargas, visual artist is the assistant curator and Daniella Pistenti Mouyiannou the coordinator of the project. The Eco Art exhibition will last from 23 April until the end of August 2017. Eco Art is one of the most ambitious projects of Pafos 2017 with cultural and ecological vision for Cyprus and Europe. Under the subtitle: Paths on Common Ground – Works in situ, the curator of the project Thouli Misirloglou, invited visual artists Hermann Pitz, Rinos Stefani, Kostis Velonis, Horst Weierstall, Stavros Panagiotakis, Mimmo Rubino, Marinos Tsagkarakis, and performers Marios Hadjiprokopiou, Antonis Antoniou and Anna Tzakou to create their works in Akamas natural areas and communities. The project will highlight the relationship between art and nature, open a dialogue on crucial issues and create an important legacy in contemporary art in Cyprus. Susan Vargas, visual artist is the assistant curator and Daniella Pistenti Mouyiannou the coordinator of the project. The Eco Art workshop will take place from 17-22 of April 2017 and the exhibition of works in situ from 23 April until the end of August 2017. Opening: Sunday 23 April 2017, 12.00 am at the Mylopetres area in Arodes village. A walk will follow on the Eco Art trail through all art works. Georgia Doetzer, program artistic director of Pafos 2017 said to CNA that Eco Arts project is the pillar of Paphos’ bid book for the title of European Capital of Culture, created by artists Rinos Stefani, Susan Vargas, and Daniella Mouyiannou. 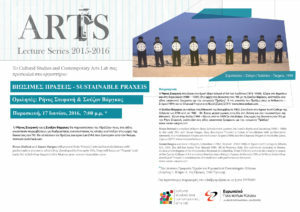 SUSTAINABLE PRAXEIS, A LECTURE BY RINOS STEFANI AND SUSAN VARGAS AT THE EUROPEAN UNIVERSITY CYPRUS, 17/6/2016, 19:00 Rinos Stefani and Susan Vargas presented their Praxeis – the interactive happenings, performances and installations which they began in the early ’90s, from the Landmarks in the Akamas peninsula to the Human Targets and Charcoal Project in 2011 in the Buffer Zone, Cyprus. 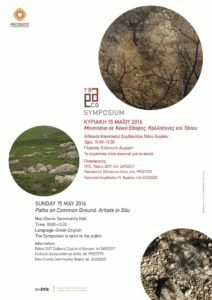 Within the context of the Eco Art programme, the European Capital of Culture – Pafos2017 Organisation along with the Cultural Association ex Artis, which is responsible for the production, present the Eco Art Symposium entitled: “Paths on Common Ground. Artists on Site”. The aim of the symposium is to highlight the most critical contemporary theoretical issues concerning the activity and the complexity of living organisms, to propose new ways for the discovery of the site and to generate the conceptual framework of the 2017 Eco Art programme, focusing on the theme and its future productions. The symposium will function as the first working platform of the Eco Art programme; the get together of artists, organisers, curators and potential guests and visitors will offer an opportunity for the mapping of natural space, the possibilities for interaction between the artists and the public and the relationship between art and nature. The art theorist, Thouli Misirloglou, who is the curator of the Eco Art programme, will be the main speaker of the symposium. Artists, foreigners and Cypriots, who will take part in the workshop of the Eco Art programme in April at the Akamas Peninsula, will also participate as speakers at the symposium. The debate on ecology, already the focal point of radical trends, which since the second half of the 1960’s saw a series of artists developing ephemeral practices in different ways (performative and conceptual), is just one of the aspects of the event. The beauty of the natural areas and the rapidly changing urban environment, along with the changing regional and international conditions, ranging from immigration and identity politics to technology and the recruiting of the arts in 2016, will offer an important starting point for contemplation and also a basis for a new perception of things, people, human relationships, goals and objectives in art. The creators of the Eco Art programme are the artists Rinos Stefani, Susan Vargas and the physicist Daniella Pisteni Mouyiannou. The symposium will take place, in collaboration with the Neo Chorio Community Council, on Sunday, May 15th 2016, in the Community Council’s Hall, from 10:00 to 13:30. The symposium will be held in Greek and English and will be open to the public. Information: European Capital of Culture – Pafos2017 – tel. 26932017, ex Artis Cultural Association – tel. 99527373. PATHS ON COMMON GROUND. ARTISTS IN SITU Thouli Misirloglou, art curator of the project Eco Art describes the event: “The symposium is the first working platform for the Eco-Art project: the gathering of the artists, the organizers, the curators and all possible guests will offer the opportunity of mapping the space, the possibilities of interaction between artists and audience, the links between art and nature. Its aim is to highlight the most crucial contemporary theoretical issues and produce the mental frame of Eco-Art project focusing on its theme and its future art productions.” The symposium is included in the official program of the Cultural Capital of Europe, Paphos 2017. Rinos Stefani, who is participating in the Eco Art project, presented his Praxeis and Installations which he did with Susan Vargas beginning in 1990 in the Akamas area, Cyprus. The Praxeis included his early Landmarks, Mannequins, Soldiers – Targets and Human Targets as well as his most recent Charcoal Project that he did in the Buffer Zone, Cyprus. PRESENTATION BY RINOS STEFANI: I will talk about some of my Praxeis, a work which is a combination of installation with some performative elements and I think is related to the Eco Art project. I will concentrate on those projects which I did with Susan Vargas beginning in 1990 in the Akamas area, Cyprus. LANDMARKS, 1990, we were doing a kind of earth works, using wood, stones, found shoes, any material available; it was like leaving a landmark or a cryptic message or like saying “we were here”. There was a lot of play. We didn’t document anything and the few photographs we have are by chance. There was an interesting incident on television reporting that some shepherds or fishermen had discovered some strange arrangement of objects in Akamas made by Satanists… PRAXIS WITH EARTH, 1991 performance in Apocalypse Gallery, Nicosia. I filled the gallery floor with earth and placed a large glass, from floor to ceiling, dividing the room in two halves; one half for the audience and the other half for myself. I walked in circles a few times holding in front of me a large mask that was part of a tree trunk and I stood in front of the glass looking at the audience for a few minutes which was a long time… Afterwards I covered the whole glass with mud and blocked visual contact with the audience. MAA MANNEQUINS, 1992 at Coral Bay beach in Paphos, placed 20 plastic, life-size dolls among the bikini-clad crowd. This work was questioning notions of beauty and commented on mass tourism and consumerism. MOUSETRAPS, 1993 I participated in an exhibition in Nicosia and Kyrenia Castle, that was 10 years before the opening of the check points on the Green Line of divided Nicosia. SOLDIERS – TARGETS 1994, is an installation that deals with violence. Everything started after I found a military target in Akamas which was used by the British army. It was a powerful object. I saw a double meaning, an oxymoron, into this image. Man aims at his own nature, aiming at himself. This is the first layer of violence. During an exhibition in Nicosia, three of the Soldiers – Targets were stolen and this incident fed the media with interesting news, eliciting varied reactions from the Police, the Nicosia Municipality, the Chamber of Fine Arts and the Ministry of Education and Culture. Among the most tragicomic aspects of this case were the various testimonies that I had to give to the Police. Some weeks later the police found one of the soldiers. Two are still missing. The “Targets case” remains unsolved in the files of the Criminal Investigation Department, under record number Σ/744/94. It was a very interesting project, the adventure of the S-T put me face to face with the contradictory nature of social institutions and mechanisms like the Police, Municipalities, Ministries, those who are supposed to protect creativity and freedom but often become the negation of these values and human rights. This is a layer of violence which lies deeper, beyond the surface. The Soldier-Targets installation was shown in different places. HUMAN TARGETS, installation 2000, it was another version of the Soldiers – Targets. IOTA & LAMBDA, installations 1995, in different open spaces, usually in beaches. CHARCOAL PROJECT was an interactive performance in the Buffer Zone of Tylliria, Cyprus, in 2011 with the support of the UNO. I lived in the Pyrgos area for three years and experienced the production of charcoal which has been a long tradition in the area. The Buffer Zone – which in Greek is also known as a Dead Zone is a place not only militarily and politically sensitive, but also an area with intense conceptual and symbolic connotations. The symbolism of charcoal and the conceptual context of the Buffer Zone connotates conflict, war and devastation. The use of charcoal in this place of separation and death can mean exactly the opposite, reversing the symbolism. ECO ART A project by Pafos 2017 European Capital of Culture. The project consists of two phases: The Eco Art Symposium (May 2016) and The Eco Art in 2017 (April–August 2017) The Eco Art is an ambitious project with cultural and ecological vision for Cyprus and Europe. It is a project that fosters and empowers even more the philosophy of the Open air factory. Akamas natural areas and communities will host the participating artists and bring their art into the open and small villages, making possible a cultural dialogue between public and artists. 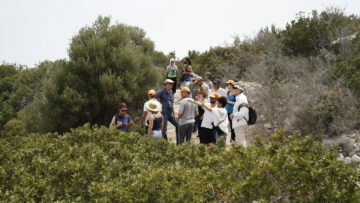 Artists from Cyprus and Europe will be invited to Akamas, Paphos to produce land and environmental site-specific works which will be exhibited in the Akamas area. The Eco Art consists of two stages: The production stage and the exhibition stage. Production will take place in April 2017 and the exhibition from April until the end of August 2017. Rinos Stefani is a member of the Advisory Panel for the Artistic Program of Pafos 2017 European Capital of Culture. He created several art projects since 2011 and was in the team who developed the Pafos’ proposals for the candidacy for the European Capital of Culture. His projects were included in the bid book and are part of the official program of Pafos 2017. One of these projects is the “On Target” which will be implemented in the summer 2017. ON TARGET A project by Pafos 2017 European Capital of Culture The project “On Target” aims to examine the many forms of violence. The original idea of this project is based on the installation work “Human Targets” by Cypriot visual artist Rinos Stefani. The target is a universal and powerful image. It is often related to violent blows and destructive actions towards people and nature. A target metaphorically means a person or a community who is the aim of an attack, a racist abuse, a victim of exploitation etc. The target has also a positive meaning. It’s a desired goal, an aim to be attained. Cyprus is not only surrounded by countries in conflict but has itself gone through a traumatic experience of war, uprooting of people, refugees and immigrants. Military targets, check points and barbed wire, the Buffer Zone and United Nation soldiers are images which constantly remind us of this violence. Even though the uncertainty of the divided land and people of Cyprus creates tension and anguish there is a hope for peace and reunification. Cyprus is a “target”. Similar situations of violence have been experienced by other European and Middle Eastern countries. For the “On Target” project, artists whose work is related to the above general concept will be invited beginning of July 2017 to exchange ideas and show their work. The exhibition will be organized in the Pafos Municipal Gallery – Pinakothiki and in the garden around it in the summer 2017. KATHREPTIS INTERNATIONAL GATHERING OF CULTURE ACTION EUROPE, ATHENS, 20 NOVEMBER 2015. RINOS STEFANI TALKED ABOUT THE CHALLENGES OF PAFOS 2017. Kathreptis (mirror, in Greek) is an international gathering to discuss culture, people and cities in a groundbreaking way. Some guests – intensively engaged in transforming their cities – acted as “mirrors” in specific moment of this process in order to provoke imagination, not to give solutions. The gathering spirit is “cut and try” – more than simply “copy and paste”. THE AIM To gather a group of varied people (from Athens, other European cities and beyond) willing to look for new, innovative and potentially disruptive answers to an ambitious, timeliness and universal challenge: How engaged people in culture and citizenship can come together to enhance the life of those living in the city? And how to create them in the historical moment we are living in? Cities today represent the front-line of all tensions, possibilities and hopes. It is where the battle for sustainability will be won or lost. We believe culture (not limited to artistic expression) has the indisputable potential to help develop those capabilities that make human beings able to deal with this societal and historical transition. THE FOCUS To collectively answer questions such us: what kind of cultural life do cities (and citizens) need today? What are the conditions that facilitate it? What kinds of relationships are necessary to make it happen? How do they need to be developed and structured? With what objectives, patterns and elements? The answers that come from the Athenians’ radical needs and imagination can be essentials both to Athens itself and to the whole Europe. THE PEOPLE Anyone who is highly involved in the cultural life of the city (both from Athens and elsewhere, from the cultural sector or from the broader civil society, from the grassroots, the Academia, the institutions…) is invited to participate and contribute. Some inspirational guests from other experiences and cities of the world (Europe, Central and South America) have been invited to join and will work hands-on with others to answer the questions at the core of this gathering. THE FORMAT The process and the programme are being designed around the principles of collaborative problem solving and discovery-driven learning. They will allow heterogeneous people from different backgrounds to contribute taking stock of their own experiences. Participants will be involved in small groups working sessions, as well as large group discussions. Inspirational guests will incite dialogues, share their stories and support the group in the sense-making activity. Everyone will be asked to contribute in a very active manner. The architecture of the gathering results of an intense period spent on the ground in Athens, in which we met cultural practitioners, artists, theorists, urban planners, sociologists, activists, citizens and many more. Rinos Stefani talked about Pafos 2017 European Capital of Culture and the Open Air Factory which is the central concept of its programme. He spoke of the importance of culture and art functioning outside the conventional exhibiting spaces and the need for a new openness in our way of communicating. He emphasized the need to apply new ways of collaboration enhancing tolerance, acceptance, inclusion of different cultures, ideas and beliefs. He said that Pafos at the crossroad of the Eastern Mediterranean being between Europe, Asia and Africa can become the first European Capital of Culture, which will act as a link for cultural exchange between East and West. He expressed the need for bridging the differences between Pafos’ various groups of citizens: residents, visitors and migrants. In the presentation of some of his work “Praxeis and Installations” especially the “Charcoal Project in the Buffer Zone” he focused on the relationship between the Greek and the Turkish Cypriot communities. The reunification of the country and people, he said, is vital for the future generation. Projects of Pafos 2017 which contribute to this objective are “Eco Art”, “On Target” and “Trauma and Therapy”. 26 November 2014, at 7.30 p.m. at the Cultural Center of the Bank of Cyprus (Faneromeni, Nicosia). Η εκδήλωση περιλάμβανε σύντομη ανασκόπηση του έργου του Κώστα Στάθη και παρουσίαση νέων σημαντικών ευρημάτων από την ομότιμη καθηγήτρια της Σχολής Καλών Τεχνών Αθηνών και διδάσκουσα στο ΤΕΠΑΚ Νίκη Λοϊζίδη. Η όλη εκδήλωση φιλοξενήθηκε από το Πολιτιστικό Ίδρυμα Τραπέζης Κύπρου και τελούσε υπό την αιγίδα του ΕΚΑΤΕ με την υποστήριξη της Σχολής Καλών Τεχνών του ΤΕΠΑΚ. Η συζήτηση προκάλεσε μεγάλο ενδιαφέρον και υπήρξαν παρεμβάσεις από το φιλότεχνο κοινό.